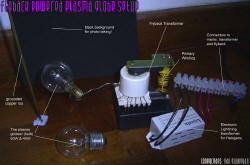 Introduction: An overview on what a plasma globe is and who invented it. How it works: Basically, how it works. Multimedia: More pictures and videos! 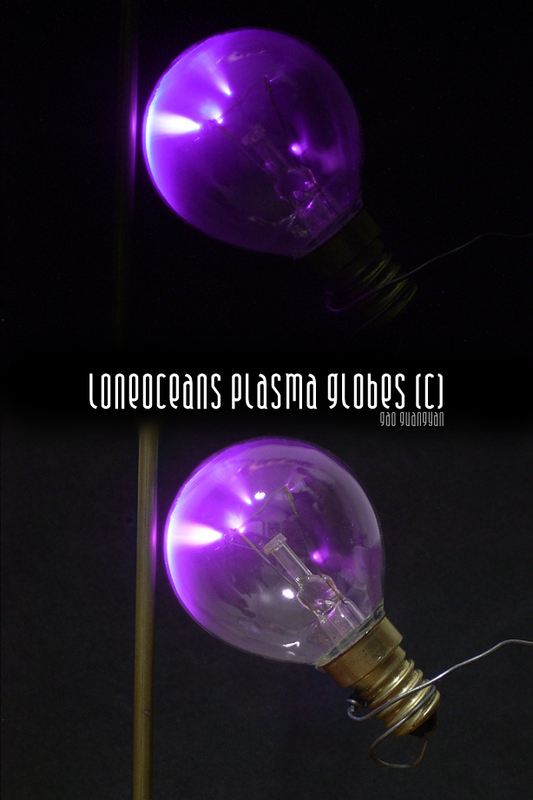 Plasma globes (also known as plasma spheres, lightning globes, plasma lamps, etc) were invented by Nikola Tesla, mainly for studying plasma. You most probably have seen them before. They are glass spheres with dancing coloured streams of light and are often seen in science centres, museums, sci-fi movies, science exhibitions, science fairs etc.. 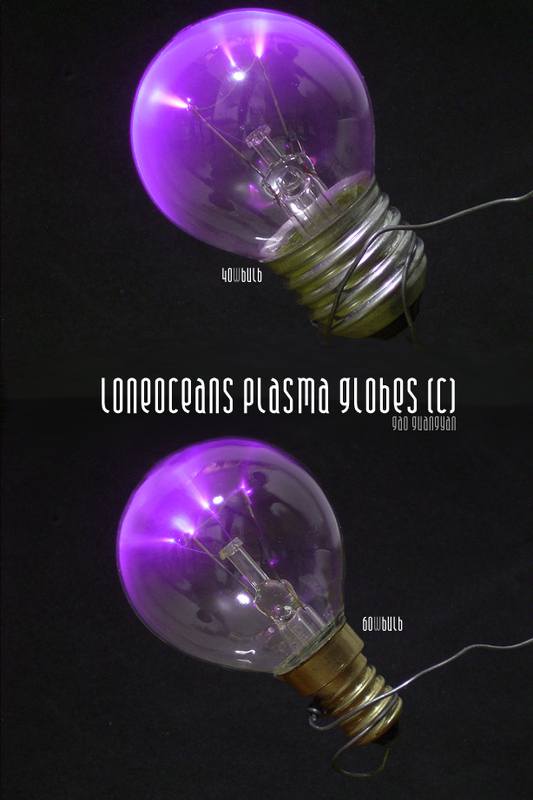 They are very attractive, and different plasma globes have different coloured streamers, some even with multiple coloured streamers. Nowadays, one can purchase a professional plasma globe at a low cost. On the right you can see a photo of a normal spherical plasma globe. But how exactly does a plasma globe works? 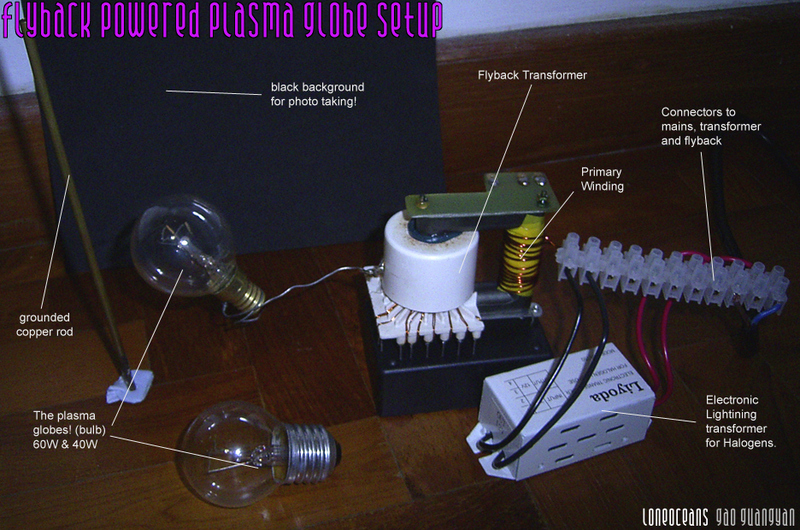 In this page, I shall explain briefly how a plasma globe work, how different effects can be achieved, and how I I made my own plasma globe, including pictures and diagrams. How does a Plasma Globe Work? "The principle of operation in plasma globes involves two main concepts: one is plasma dynamics, and the other one is capacitive current flow. First let's look at what is inside the globe: The most obvious answer would be "plasma"... But what really is plasma? Simply put, a plasma is "a hot, ionized gas". It is also defined as being the 4th state of matter, as it does not consist of molecules like the other 3 states: Instead, a plasma is made up of ions. In order to understand how this comes about, we have to look at what a plasma globe really is: A middle electrode (sometimes insulated, other times not) sitting inside a large vessel containing inert gas. The gas must be inert (I.E. non-reactive) otherwise it will react with the electrode surface (inert gases also have a low voltage breakdown). And it must be at low pressure in order for a not-too-high voltage to be able to break it down. Than the electrode is energized with a high voltage-high frequency power supply. The high voltage breaks down the gas, and the high frequency gets the current through the glass of the globe and into the surrounding air by capacitive coupling. 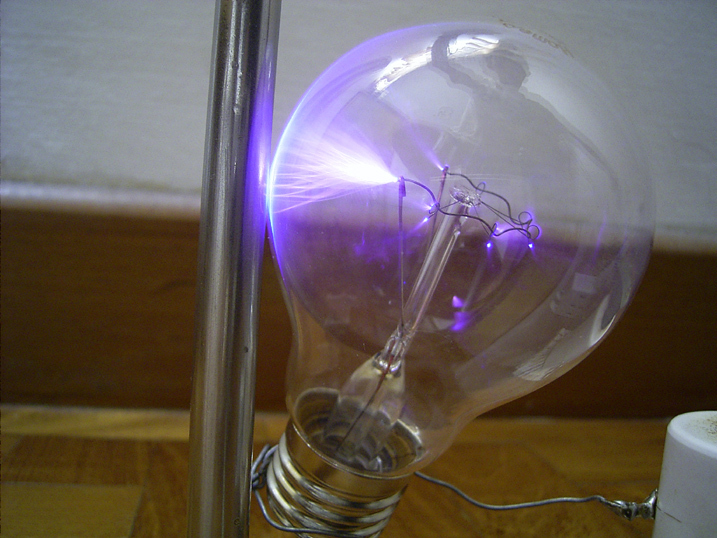 Typical voltages are around a few thousand volts for most commercial plasma globes, sometimes around 10,000 volts for some homebrew ones, or the larger commercial ones. Typical frequencies are from a few to a few tens of kilohertz. Essentially, what is happening inside a plasma globe is the travel of electrons from the electrode to the outer surface and an oscillating electro-magnetic field. The motion of the electrons is necessary to generate plasma. 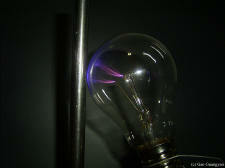 A plasma is simply a gas containing charged particles such as electrons and ions. The electrons are broken free from a parent atom or molecule, and that atom or molecule becomes an ion. The electron has a negative charge, and the ion has a positive charge. When these charged particles move about within the plasma, they are changing the local characteristics of the electro-magnetic field. 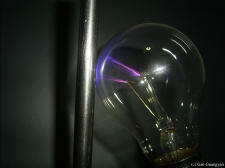 This combined with the oscillating electro-magnetic field from the electrode will "excite" ions, molecules, and atoms. When these particles (whether they have a charge or not) become excited, they very quickly radiate the energy in the form of a photon, or unit of light. This is what makes the plasma emit it's characteristic color, and the color will depend upon the gas that originated it, and it's temperature. 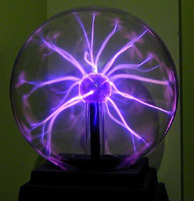 The characteristics of how these electro-magnetic fields combine is what determines the overall appearance of the plasma globe. The electron will fly off of the electrode if the voltage at the electrode is sufficiently high. What voltage is sufficiently high? The very minimum voltage required for an electron to escape a metal electrode is determined by the "work function" of the metal. The metal electrode will hold the electron until the electron reaches a potential sufficient to break this bond. For most metals, this is only 4 or 5 volts, and is called the work function. 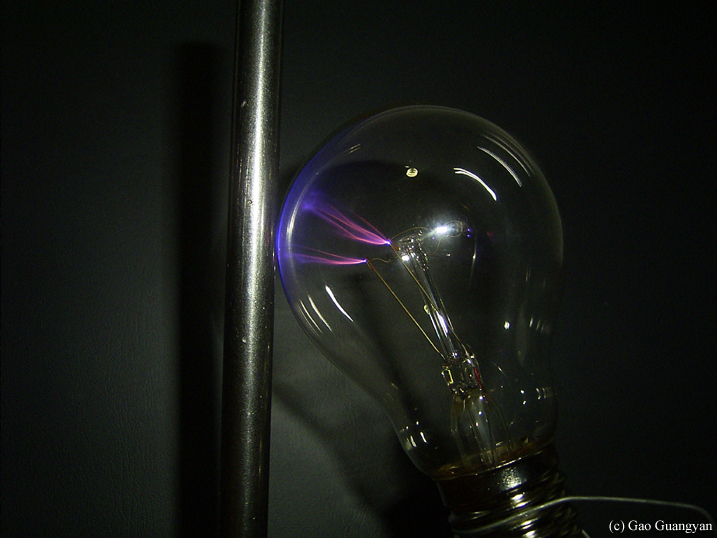 After the electron leaves the electrode, ignoring the glass interface of the typical plasma globe, the electron must then "collide" with and ionize an atom or molecule before a plasma can be generated. There are many different ionization states for the gases found in plasma globes, but the important thing to know is that the electron must have a minimum amount of energy to be able to ionize an atom or molecule, and this energy is called "ionization potential". For gases such as nitrogen, oxygen, neon, etc., the first ionization potential is typically 50 to 150 volts. So, for a plasma to be made, the electrode potential (i.e. voltage) must be at least the sum of the first ionization potential of your gas plus the work function of the electrode metal, and any extra potential helps increase the plasma density. Even though your plasma globe is "evacuated", it still has a HUGE number of particles. A typical 8" diameter plasma globe (with a pressure of ~500 milliTorr) will still have 100 billion billion particles! Assuming all of the particles are spaced evenly, this means the average distance between particles is so small that approximately 2500 particles span a length equal to the diameter of a human hair! So, an electron does not need to travel very far to "interact" with an atom or molecule. In fact, the mean free path of the molecules themselves is about half of a millimeter. An electron can travel farther than this without interacting with a molecule, but not much farther, due to to electromagnetic interactions (as opposed to collisions, which have a rather long mean free path). The pressure in the globe will help determine the characteristics of the streamers. The pressure in a plasma globe is actually much higher than the pressure found in most plasma chambers used for scientific experiments. In fact, the pressure needs to be this high to see the streamers. The pressure is so high that when plasma is generated, it actually gets hot. Since hot air rises, the streamers will tend to move up the side of the globe. Also, this hotter region has much higher conductivity, since it is a plasma, and therefore the streamers remain intact until an instability breaks them. This is the same principle behind a Jacob's ladder (the cool looking arc traveling up between two wires commonly seen in Frankenstein movies - it gets longer as it goes up the wires). If the pressure in a globe is too high, the potential of the electrode will not be sufficient for the electrons to generate a plasma, and you will see nothing. If the pressure is too low, the effects of the "fluid" nature of the streamers will be gone - and you will only see an overall illumination of the globe, with no streamers. The intensity of this light will be rather low, also. "I am beginning to see the light!" So, how is the light generated? Now we are getting into the physics of atoms and molecules, which involves the gory details of quantum mechanics. The effect that causes an ion, molecule, or atom to release light is called spontaneous emission. This occurs when a particle (read particle as ion, atom, or molecule) is in an "excited" state. This basically means that the particle has more energy than a stable particle, so it is unstable. The particle will spontaneously emit a photon (a unit, or "quanta" of light), which reduces the particles energy to a more stable condition, or "state". This photon is visible only if it has an optical wavelength. Most of the excitation states for particles that will emit light are such that the wavelength of the emitted light is visible, making plasma easy to see if the density is sufficiently high. Also, these emitted photons are of an exact wavelength. Each time a particle goes from the same higher energy state to the same lower energy state, the same photon will be emitted. This is what gives gases their characteristic appearance - only certain colors are capable of being emitted. The ONLY way to change the color of the plasma is to change the gases inside the chamber, or increase the electrode voltage to increase the number of energy states possible (and therefore emission states, however, when you do this, the plasma color usually tends towards white or blue). So what causes a particle to become "excited"? No innuendoes here, but particles in a plasma globe are easily excited by a charged particle flying sufficiently nearby if the (moving) particle has enough energy. Either an electron or ion can serve as the charged particle - but generally this occurs due to an electron-particle interaction. The electron will lose some energy by transferring it to the particle. The particle then releases this energy in the form of a photon. You can see the light emitted only if thousands of particles are "spontaneously emitting" light at essentially the same time - simply to get an intensity high enough for the human eye to detect. In a plasma globe, billions of such interactions are occurring. For extremely energetic electrons (voltages at least 10 times the first ionization potential) many interactions can occur before the electron loses it capability to ionize or excite particles in the globe. Such high potentials are typically not needed for a scientific plasma, since pressures are low and methods of confining the plasma are heavily used. In a globe, the plasma particle has an extremely short life (before it becomes a neutral particle again) due to the higher pressure and lack of magnetic confinement. 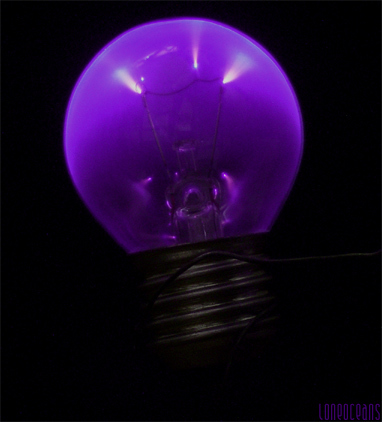 Plasma displays, such as the very common Eye of the Storm displays, typically have only one electrode from which plasma trails or streams propagate. This type of IGDT (Inert Gas Discharge Tube) requires a very high voltage, high frequency AC power supply. Since the IGDT has only one electrode, the return path for the current flowing inside the tube is the air itself. The capacitance between the high voltage electrode and the circuit ground is the only return path. Current must flow via this stray capacitance through the surrounding air to the circuit ground. The stray capacitance is quite low which is why the voltage and frequency must be so high. The path that the plasma trails follow varies a lot during operation for several reasons. The plasma trails created in the IGDT tend to move rather randomly and are generally dimmer and thinner than plasma flowing through sign-tubes, which have two electrodes. The trails keep moving because the charged or ionized gas areas keep moving. Charge builds up in areas without trails until they ionize. Then the charge carriers in a cloud region collapse into an ion trail, which is a good conductor, which allows current to flow to circuit ground, draining the charge. Once the region is discharged, the trail may disappear or migrate in some direction towards another area, which is charged. The trail will continue to exist as long as sufficient current can flow. You yourself can become a return path by touching the glass surface because you are a better conductor than the surrounding air. 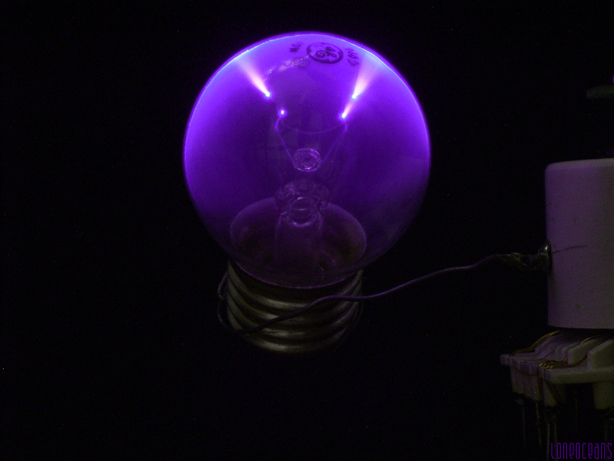 One very important thing to consider is that since the power supply is operating at a high frequency, the plasma globe or tube is in fact an antenna. You are like an antenna in many respects as well. High frequencies cause a skin effect, which prevents you from receiving a shock. The currents you carry are very low and tend to flow along your surfaces. 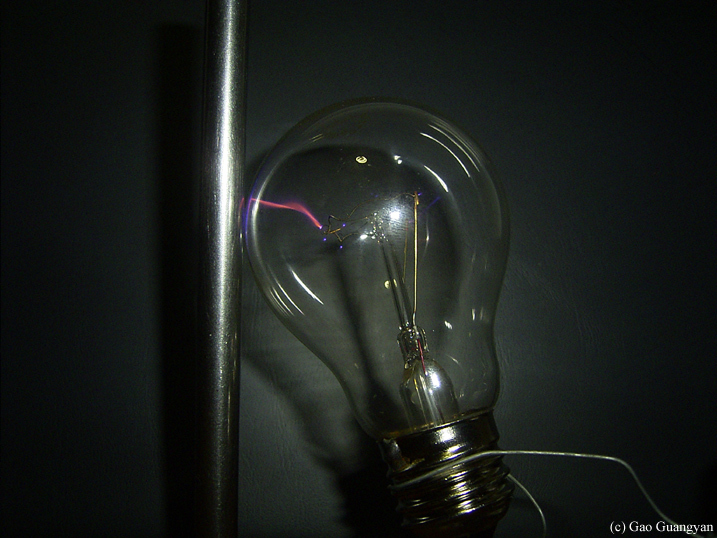 The glass envelope and the plasma trail itself are also providing decoupling from the power supply electrode. This protects you to some degree. Since the display globe acts like an antenna, it conducts or transmits more power near its self-resonant frequency. It will have the most trails when operating at that frequency because the power transfer is most efficient. The oscillating field that is generated can transmit power into and through other objects, which come into the field. It is very easy to make other tubes, especially Neon and florescent ones, glow in your hand just by holding them inside the electromagnetic field near the operating plasma globe. You can then use a simple Neon candle-flicker bulb to observe the relative field strength at any point in space surrounding the display because the bulb will light up accordingly as the field excites the gas within. Power supplies designed for plasma displays can also drive neon sign tubes. If you want to do this, you should connect only one electrode and leave the other electrode disconnected and insulated. If you connect both electrodes, the current that flows through the tube can be very high. 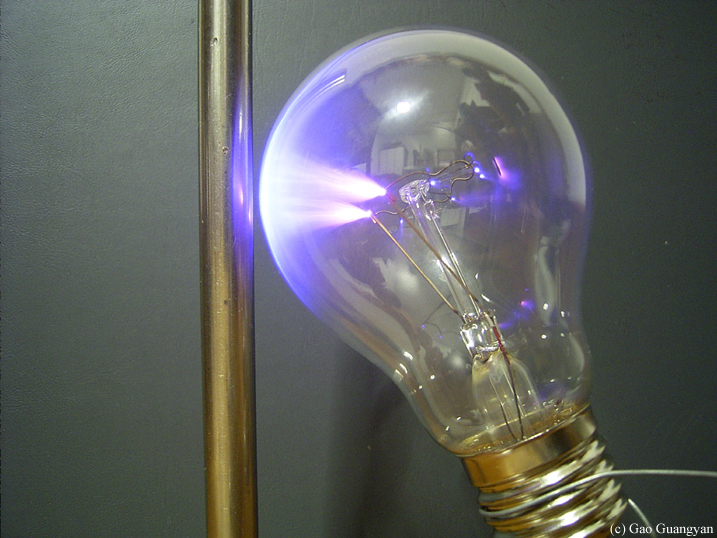 At the high frequency at which a plasma power supply operates, the thin Neon tube's electrodes may concentrate the current towards the metal surfaces of the electrodes. This skin effect can increase the apparent impedance or resistance of the electrode and cause a significant (exponential) rise in power dissipation & therefore they'll run a lot hotter than they were designed to. When current flows, people have described electrons moving in one direction and positive ions moving the other way. This in fact occurs in certain circuits, which rely on the electrochemical transfer of atoms of an electrode through an electrolyte material. This process occurs in batteries. This does not occur in IGDTs or typical semiconductor circuits. While the electrons do in fact move from atom to atom, the atoms themselves pretty much remain where they are. Light is emitted when an atom loses an electron, thereby changing to a lower energy level. This happens to the atoms in the slurry of gas millions and millions of times per second as the electrons make their way along the plasma trail. This means they are constantly changing their state of charge relative to their neighbors and they'll just bounce around willy-nilly all over the place. As a result, the positive ions do not remain positive ions for long. Even if they did and even though it is true that positive ions would be slightly attracted to a negatively charged electrode at one end, they really don't move much because the physical forces of pressure continuously act to keep the gas evenly distributed throughout the tube. Some people call the places left behind when an electron leaves an atomic orbit a hole oddly enough, which technically makes the atom a positive ion. It is said that the holes move one way while electrons move the opposite way. Holes are not actually things or particles as electrons are so even though both statements made about what is moving is technically true, I prefer to say the electrons are moving rather than the absence of them or the nothingness. In either case, the atoms themselves pretty much stay put. Proof of this is simple to observe. 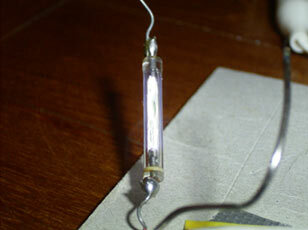 Just look at the light emitted in a normal florescent tube. Pretty evenly distributed isnt it?" 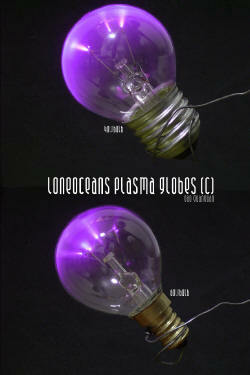 Today, are are many different kinds of plasma globes. The most common ones uses a spherical glass globe, filled with a specialized low-pressure gas mix. Because professional plasma globes use a very low pressure, they usually have lower voltages and use a lower powered power supply. The different mixture of gasses give the globes different colours (from helium to neon, to krypton etc) . Furthermore, the lower power allows the globe to be safely touched, unlike mine which has too high a current to handle safely. Globes come in all sorts of shapes and colours these days. As you can see in the pictures above, globes come in all sorts of shapes and sizes. Constructing a plasma globe like professional globes is difficult. A strong glass globe is needed, as well as a powerful vacuum pump and special gases to fill the globes. As such, I have a different approach. To your right you can see a picture of the setup from above. This experiment was performed by a lighting transformer flyback driver instead of the solid state transistorized version. I used a cheap Electronic Halogen Lighting Transformer because it was sufficient and easier to put together than the transistorized version. Also, I did not have a decent power supply for driving the transistor circuit. View my other flyback page on how to build a driver for it. *Update 23 Mar 04! I have acquired a new 34A 12VDC power supply. The transistor version is now working. More powerful arcs and voltages can be achieved! More updates to come! Here, you can see my entire setup. The connector connects the mains to the transformer to the flyback. The primary is 13 turns of insulated copper wire at 11.5V, 20khz AC. It is a good non-rectified flyback and produces large long arcs. The backdrop is black to facilitate easy photo taking and I will be using 40W (big fat one) and 60W (thinner bottomed one) light bulbs for the experiment. (Apparently, they don't make much of a difference). The copper bar acts as a grounded object for the arcs to arc to in the globe. Click to see a full view. And here's a diagram of how I wired it all up. Quite simple actually. 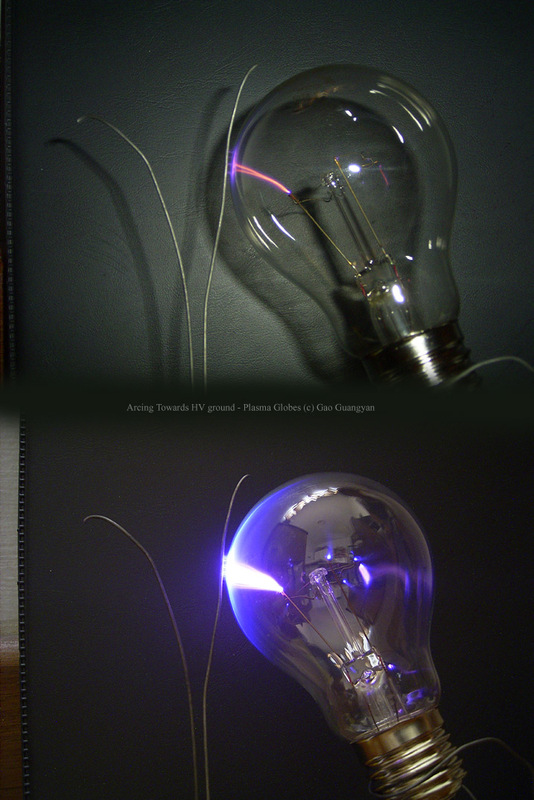 These 2 pictures show show a ~4cm diameter 40W and 60W incandescent globes attached to the driver. A word of warning: the plasma streams are extremely tightly focused and they can carry a lot of current (lethal currents, if your power supply is not limited). This is typical of Nitrogen. 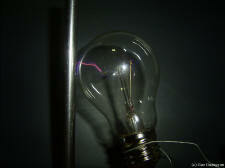 You'll notice that the streams in a light bulb have the very familiar lightning-like appearance. Our air is almost 80% Nitrogen hence the similarity. Furthermore, UV light is produced, harmful in large amounts. As you can see, the plasma streams are going in an upward direction due to the electrodes and also the rising action of the hot plasma! Touching it gives a tingling effect to the fingers. Do not touch it! By putting a sharp metal point on the surface makes the plasma streams extremely focused and at a slightly higher level, it would melt and burn through the glass! From the pictures, the two different bulbs don't have much of a difference though. Above you can see see the streamers trying to arc to the copper rod which is grounded. Notice how intense the streamers are. This hot plasma channel forms when I touch it too. You can't touch it longer for a few seconds before it gets really hot, enough to give a nice burn. In real life the arcs are bight purple, some almost white. 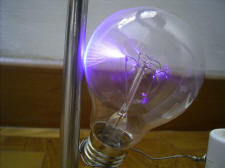 With no more bulbs lying around at home, I went to the mart and purchased a cheap 100W clear incandescent bulb for 50c. It's cheap, clear and quite large compared to my 40 and 60W bulbs. Anyway, I connected it and fired it up. Instead of the normal purplish arcs, some arcs were quite red, possibly due to slightly different gas mixtures inside the glass envelope, like argon. Here you can see the streamers arcing to the metal pole in a 1/2 second exposure. Notice the banjo effect as the streamers rise up (they are hot, and therefore rises) . Also notice the other corona breakouts along the sharp points in the bulb. These two are one of my favourite shots. It's 1/42 second exposure with the flash. Nice reddish to purple streamers can be see breaking out from two sharp points. Fierce arcing to the metal rod can be observed. The streamers formed within the 100W bulb were longer and more spectacular. Some streamers turned out reddish which produced marvelous colours. Remember to look at the videos section. Download the last video the see this bulb in action! A marvelous display of the larger 100W bulb (6cm dia) with beautiful streamers. The first one is a 1sec exposure picture showing the bright purple streamers. The next two pictures on the right show how wonderful the streamers are (1/52 sec exposure). Look at those colours! Most of the steamers beak out from two main points. 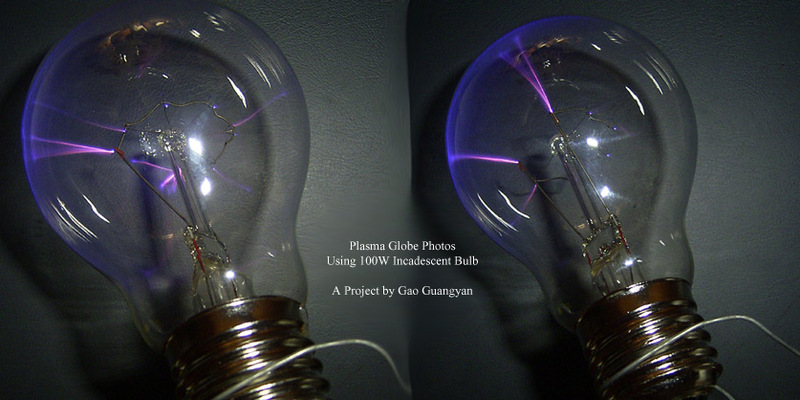 Here you can see two pictures (one with flash and one longer exposure) of arcs from the plasma globe towards HV ground. Again, a nice reddish arc can be seen in the first picture. I am particularly fond of these nice red arcs which blend into purple. You can also make out tiny arcs from the glass towards the HV ground. 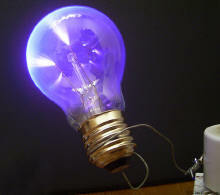 Not only can does this flyback power bulbs, photoflash xenon tubes work as well! They light up extremely brightly. Bright white! Here are some clips of the plasma globe in action!